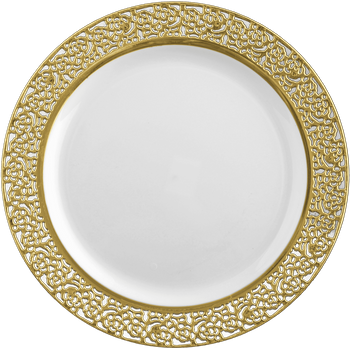 The Inspiration White with Gold Lace Border is a beautiful plastic dinnerware that is worth its weight in gold. Your special occasion will be treasured forever with these attractive disposable plates for weddings. It could be a once in a lifetime wedding reception or a 50th anniversary party. There is no formal occasion that the Inspiration with Gold Lace does not fit. A Party Source if your one-stop shop for plastic plates for weddings and much more. Check out our selection and see all the different ways we can make your special day even more amazing.